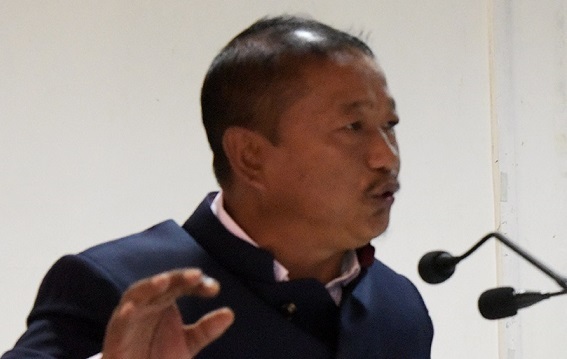 Arunachal Pradesh Rural Works Department Minister Bamang Felix on Monday said the Centre has recently sanctioned 5,025 km of Pradhan Mantri Gram Sadak Yojana (PMGSY) road worth Rs. 3,837 crore. Minister Felix revealed this while chairing a two-day review meeting of the department on Pradhan Mantri Gram Sadak Yojana (PMGSY) here. he also directed the officers concerned to finish the NIT and the process of awarding works within January so that there is no further delay in the execution of critical border rural roads. Felix said the failure to complete 1,600 km of rural roads in the State by this financial year would be the collective responsibility of everyone in the department. Exhorting the department officers to tighten their belts, Felix said that the State today demands sincere and hard-working officers who would genuinely deliver for the good of the people. Rural road being one of the most vital communication means, the department needs to work with renewed energy to ensure that the roads reach the last village of the State, he said. “PMGSY implementation has to be accelerated to accrue the benefit to the remotely located habitations for overall socio-economic development of the State. The rural roads contribute significantly to the GDP of the State and therefore all the roads have to be constructed with good quality,” Felix added. The physical progress, achievement, contract management, new technology, District Rural Road Plan for PMGSY-II and quality issues are being covered in the two-day meeting. Interaction with contractors and contracting agencies will also be convened on the second day on Tuesday to know the problems being encountered in the field and their input will be useful for achieving the target and fast execution of this flagship programme to achieve connectivity by March 2019, the deadline fixed by the Centre. All the field engineers from junior engineers to chief engineers participated in this State-level review meeting to address various administrative and field issues. Among others, RWD deputy secretary Higio Tala, chief engineers K Tabiyo and D. Nyodu, State quality coordinator T Paktung, IT nodal officer N Rigia and technical advisor K C Dhimole are reviewing the progress and assessing the issues and challenges.